Purpose: Orbital invasion of periocular basal cell carcinoma (BCC) is a potentially life-threatening condition with high levels of ocular morbidity. Exenteration results in significant disfigurement and permanent loss of vision. We report our experience with a patient who presented with medial orbit invasion of a BCC following 2 previous microscopically adequate local excisions of medial canthal BCC, an adequate Moh’s micrographic surgical excision of the tumor, and radiotherapy. The patient underwent an orbital excision where the tumor was found to have perineural involvement and extend beyond the posterior margin. Following the pathology results of this procedure, the patient opted to try vismodegib (Erivedge®) to delay exenteration for as long as possible. Observations: A course of vismodegib was taken by the patient with minor side effects (partial alopecia, mild dysgeusia and hyposmia, and minor muscle cramps). 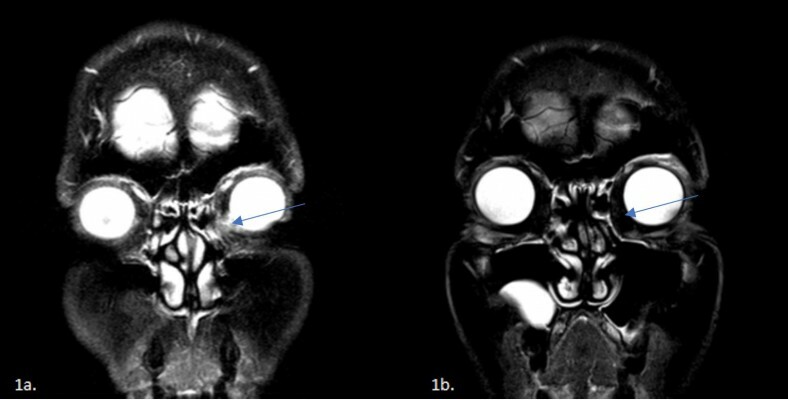 Subsequent imaging demonstrated no recurrence of the orbital tumor 29 months after orbital excision. Conclusion and importance: We demonstrate the use of vismodegib with local orbital excision as an eye-saving alternative to exenteration for advanced orbital metastasis of BCC.